In under a month, Genevieve has gone from a few tentative steps, to walking with assistance, to going solo. After one of our walks, Andrew noticed that Genevieve had walked a hole in her little See Kai Run shoes. The time had come; my baby needed real shoes. We went to Stride Rite, which is where Mom took us to get shoes when we were little. I love that they sell good quality shoes and really fit kids' feet. We picked something neutral that she could play and be comfortable in. Something that said, "I'm here to have fun!" and wasn't fussy. 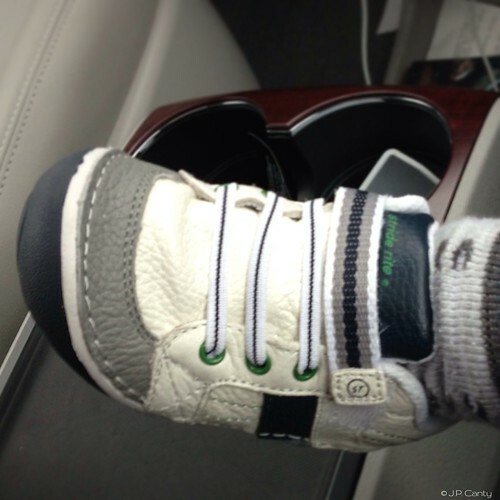 DangerMouse's first real shoes, 5.5W. I love the sound of these shoes on the hardwood in our house. It's the sound of milestones, independence. Also, trouble. So much trouble. For example, the other day when we were out for a walk, and as we turned a corner a tall teenager with a jingly backpack walked by. Guess who has two pigtails and did a complete one-eighty to follow that siren song? You guessed it. What I love most is being able to walk hand-in-hand, side-by-side with my incredible daughter. Happy trails, indeed. Such wonderful memories. And of course, big steps are coming. Love it!! I'm always telling Carmen how much I love holding her hand. :) It's one of my favorite things! My son is a grown man now but I still remember the feel of holding his little hand during those first few steps. It is the best feeling in the world! I recall every second every touch and I smile it still feels wonderful. Thanks for the suggestion! I had such a hard time finding real infant shoes for such an early walker. I'll have to look at Stride Right! You're lucky you can take actual walks with her! We still have to use the stroller since my little one will NOT hold my hand at all! Oh my goodness! I can't believe she's walking already!! 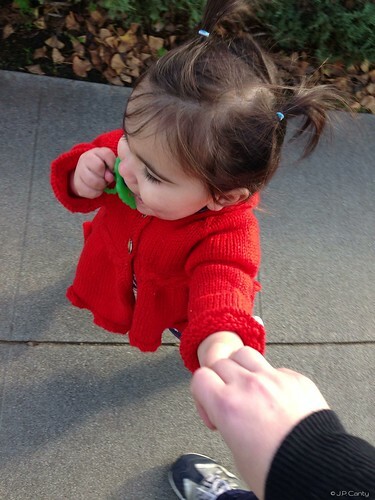 I love to hold my daughter's hand while we're walking (and she's 7 1/2, so I know my days are numbered :-( ) Really take a moment to feel that little hand in yours as you walk--it's the best feeling ever! Happy trails!